For the last month residents in Midlothian have not been getting replacement green food recycling bags. There is anedoctal evidence, based on the number of bins put out each week, that residents have stopped recycling their food waste whilst they await new bags. Midlothian View asked the council what had gone wrong. A spokesman said: “We apologise for any inconvenience to residents while we wait on a delivery of green food recycling bags. They are due in the next couple of weeks. There’s no evidence of a downturn in food recycling. 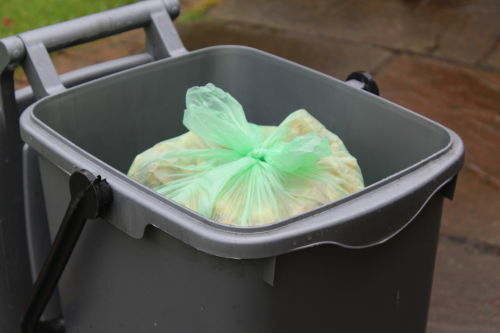 “Residents don’t need to use council-supplied bags to recycle their food waste. Any bin liner or other plastic bags such as bread bags or frozen vegetable bags, or even newspaper and paper bags can be used to contain waste. Specific food waste liners, which do not need to be biodegradable, are widely available from local retailers. The recycling bags are made in China and there is an 8 week lead time on delivery.